While the excitement surrounding this December’s Star Wars: The Force Awakens is hardly contained to just one particular thing, the film’s depicted globule gizmo in the droid BB-8 has become a breakout star. In fact, it seems that it’s already inspiring real-life homebrew contraptions that, with a little know-how, you can make on your own! 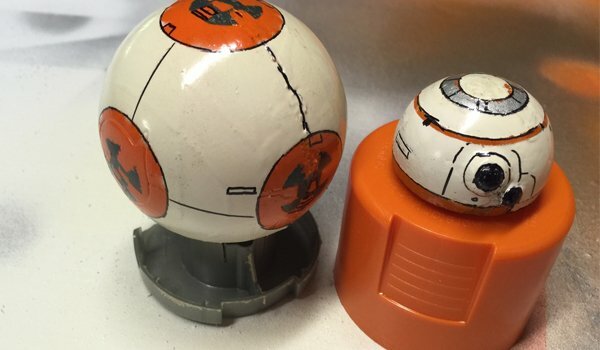 An engineering-enabled Star Wars super-fan named Christian Poulsen just couldn’t wait for the inevitable influx of BB-8 merchandise replicas we’re sure to get and decided to use his know-how to get a jump on things to a resounding success. Modifying a Bluetooth-controlled robotic Sphero ball, all it seemed to take was a little bit of surgery on the device adding internal magnets to keep the device joined to a fabricated dome. After that, it was only a matter of adding a decent paint job and voila -- a working (albeit miniature) BB-8, conveniently controlled from an iPhone! Poulsen isn’t exactly keeping a tight lid on the specifics of his awesome accomplishment, as he’s posted step-by-step photos detailing the inventive process. Apparently, the creation of this concoction wasn’t even that laborious, as Poulsen claims he was able to "make the whole thing in a matter of hours." The end result was pretty impressive, though more so when in motion than standing still, where the contraption’s home-made status is a little more apparent with its clearly defined paint applications. Plus, top-heaviness from the dome apparently makes it difficult to control. However, it’s brilliant work that serves as a preview of knick-knacks that have been confirmed by Disney/Lucasfilm to be hitting the shelves of stores soon enough. Last fall’s initial trailer debut of the rolling, rollicking desert-drifting droid BB-8 left a lot of folks scratching their heads, wondering about the physics behind the thing, which resembles a pretentious European vacuum cleaner. However, it seems that the mechanics that enable BB-8 to do what it does are very much rooted in real life. This was made ever-apparent at last week’s Star Wars Celebration in which a life-sized, fully functional BB-8 rolled its way on to the stage during the panel presentation with director, J.J. Abrams and company, stealing the spotlight from an already-present R2-D2. What seemed to be just the imaginative concoction of CGI suddenly became a bit more real. Likewise, an additional benefit to Poulson’s terrific tinkering is that it provides a clear illustration into the mindset and inspiration that went into the BB-8 droid. In essence, the groundwork based on the Sphero ball device kind of identifies it as a product of our times; inspired essentially by smartphone-related technology. Droids? There’s an app for that. We’re bound to be bombarded with bundles of BB-8’s by way of the Disney/Lucasfilm merchandising machine by the time The Force Awakens hits theaters on December 18. If this homebrew is any indication, BB-8 could end up becoming the ball-breaking bounty for parents this Christmas season.